Letters to Emma is a wonderful piece of theatre that should encourage more people to switch off their TV's at home and see what marvels are waiting to be discovered on the live stage. The play, superbly written by Lichfield based playwright Carolyn Scott Jeffs and currently being performed at her local Lichfield Garrick theatre, is based on the actual letters written by 18th century Lichfield poet Anna Seward. This creepy tale is billed as a ghost story, but it is not really a supernatural drama in the classic sense of the genre, more an intense, emotive study of mental health problems. That said, there are several very spooky moments that literally send a shiver down the spine. Carolyn, who also wrote the equally splendid Fanny: A New Musichall, which was performed at the Garrick theatre in June, has clearly done her homework in discovering that Anna Seward, who lived from 1742 to 1809, had an imaginary friend who she would pen letters to. 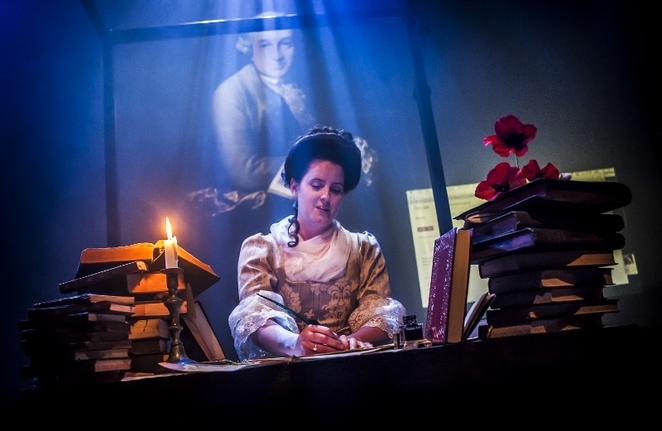 So it is that Letters to Emma opens with Anna, excellently played by Heather Westwell of New Old Friends Theatre fame, sat behind her desk in 1762 having decided to create an imaginary friend called Emma for the purpose of giving herself advice that she can rely upon. The audience is then introduced to a real-life Emma, a final year English student in the present day, superbly played by Lizzie Wofford, who also starred in Fanny: A New Musichall. Emma is clearly struggling to cope with the growing pressures caused by being dumped by her boyfriend and having to deliver her dissertation on time, while becoming increasingly distant from her friends and family. Almost inevitably, the 2017 Emma chooses Anna Seward as the topic of her dissertation, but she soon finds herself becoming more and more immersed in the life of the 18th-century writer while, at the same time, her mental stability is tested to the limit by internet trolls who subject her to vile abuse due to something she posted in retaliation against her former boyfriend. As the story cleverly develops, Anna and the real-life Emma find their lives paralleled through time with the 18th century poet also on the receiving end of hostile public opinion due to animosity over her work from the male-dominated literary world. 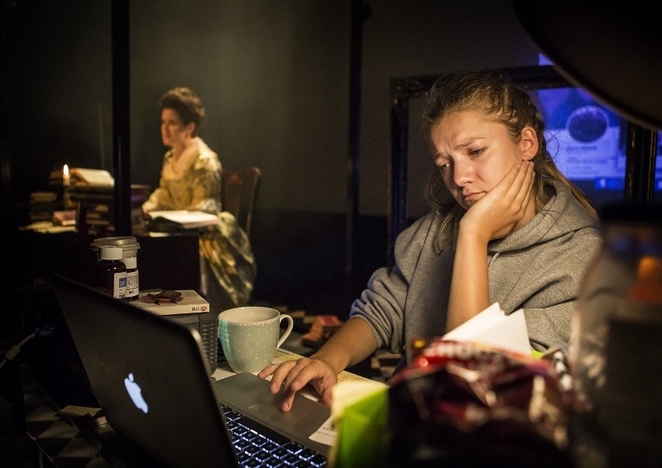 Gradually, Anna and Emma become haunted in turn - Anna by her imaginary friend and the slowly unravelling student Emma by the character she is studying. But what is reality and what is simply in the respective women's heads? Letters to Emma is produced by the Garrick Rep Company and supported by Arts Council England and the Swinfen Broun Charitable Trust. 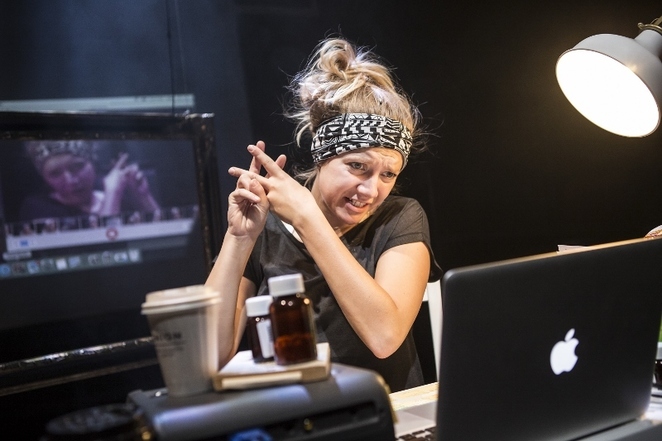 The play, which is directed by the Garrick theatre's Artistic Director, Tim Ford, continues at the Lichfield Garrick until Saturday 7 October with a variety of matinee and evening performances. Tickets are £17.50 and can be booked online at www.lichfieldgarrick.com or by calling the Box Office on 01543 412121. The show does contain very strong language.